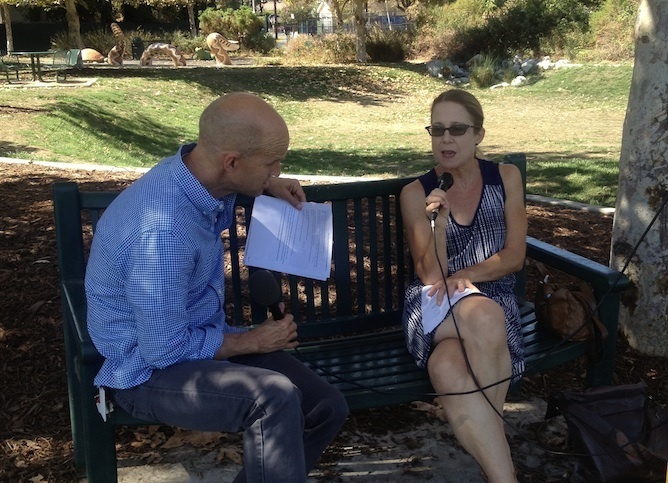 John Horn interviews Cathy Gudis of the Play the L.A. River festival at Marsh Park in the Elysian Valley neighborhood of Frogtown. 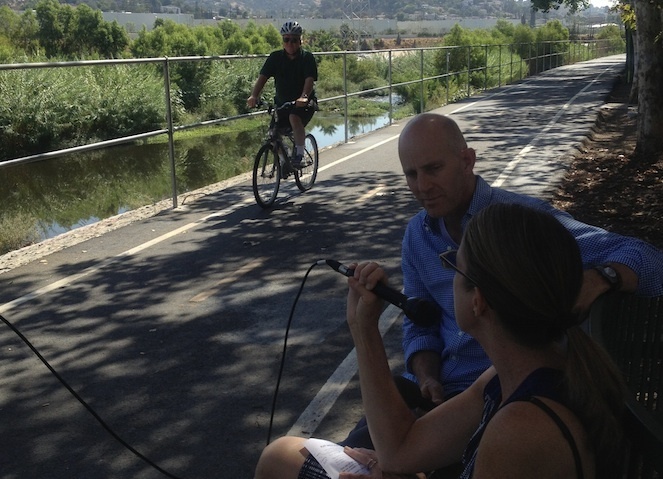 John Horn, host of KPCC's The Frame, interviews Cathy Gudis, one of the organizers of the Play the L.A. River festival. The City of Los Angeles is leading an effort to restore much of the Los Angeles River to its natural state. That will take decades and — get your checkbooks out — about a billion dollars. But a group of local artists and activists is already using the river as a stage for creativity and discovery. On Sept. 13, as part of the Frogtown Art Walk, Project 51 will launch Play the L.A. River, a year-long festival designed to encourage citizens to explore the waterway. 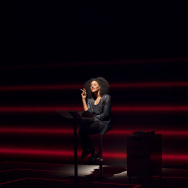 The festival will include a wide range of art events and performances. Project 51 is also distributing a deck of playing cards that serves as a guide to activities along the 51-mile-long river. The Frame's host, John Horn, spoke with Cathy Gudis, an Associate Professor of History and director of the Public History Program at UC Riverside and an organizer of Play the L.A. River. "Play the L.A. River is a project [created by] a group of people who have very diverse interests — artists, designers, scientists, urban planners. And we wondered about the ways in which the river is such a significant part of the city, yet isn't necessarily a place that many people know how to get to. 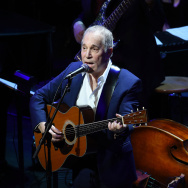 The L.A. River is 51 miles long, it passes thru 18 cities, it connects all our different neighborhoods and it's the reason why we organized Play the L.A. River so that we could actually address that entire expanse." "The arts have had a longstanding role in drawing public attention to the fact that, one, we have a river and, two, that it is a river. So, for instance, Frank Romero has a mural that's downstream from here and it has icons that are both specific to the river, but also to the founding of L.A. itself." "We thought, let's make a deck of cards. We've got 51 miles, we just need one more site [to make a full deck]. And then we realized 52 cards [is] not quite enough. So we have 56 sites that are covered in a site guide that's also a deck of playable cards." "I'm most excited about the ways we might be able to galvanize crowds that will intersect with the river over a period of a year. In either small groups, or medium-sized groups or online to post what they find. And to be able to speak very loudly about what we as Angelenos want for the L.A. River."